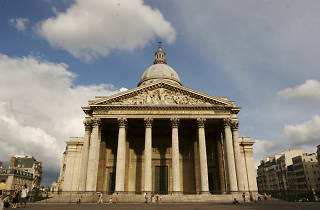 Soufflot's neo-classical megastructure was the architectural grand projet of its day, commissioned by a grateful Louis XV to thank Sainte Geneviève for his recovery from illness. 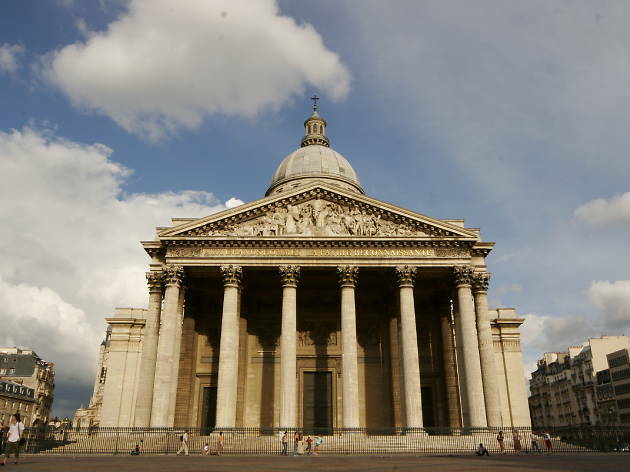 But by the time it was ready in 1790, a lot had changed; during the Revolution, the Panthéon was rededicated as a 'temple of reason' and the resting place of the nation's great men. The austere barrel-vaulted crypt now houses Voltaire, Rousseau, Hugo and Zola. New heroes are installed but rarely: Pierre and Marie Curie's remains were transferred here in 1995; Alexandre Dumas in 2002. Inside are Greek columns and domes, and 19th-century murals of Geneviève's life by Symbolist painter Puvis de Chavannes, a formative influence on Picasso during the latter's blue period. Mount the steep spiral stairs to the colonnade encircling the dome for superb views. A replica of Foucault's Pendulum hangs here; the original proved that the earth does indeed spin on its axis, via a universal joint that lets the direction of the pendulum's swing rotate as the earth revolves.